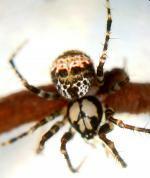 The Biting Jumping Spider is shiny black in colour, with a pale patch on the back of the head and a pale stripe down the centre of the abdomen. It has large eyes and the first pair of legs are strong with spines for catching prey. The eyes are arranged in two rows and the first pair are large and forward facing. 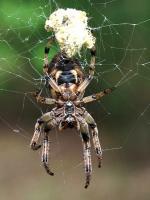 They build no web but often construct silk sacs to rest and moult. common in shrubs and trees. insects such as flies and moths that they pounce on. 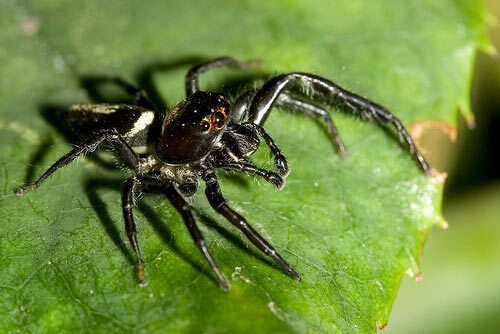 Many jumping spiders are harmless. Some will bite if roughly handled causing mild local pain, but no long-lasting effects.